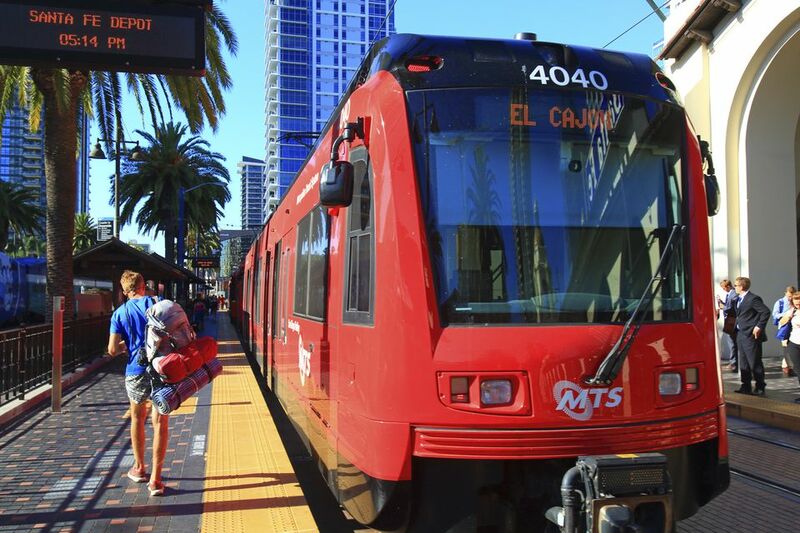 Riding the bright red San Diego Trolley system (The Trolley) is a great way to get around San Diego and see the diversity of the city. They offer a discount for seniors and the disabled, and the trolleys run every 15 minutes— 7 minutes peak and 30 minutes off-peak. Three lines (Blue, Orange, and Green), 134 signature red light rail vehicles, 51 miles of track, and 53 stations take you through a wide swath of the city and surrounding communities. There are trolley stops where you'll want to get off and explore the surrounding neighborhoods and some that are not so interesting. The Trolley is a great way to get to some key attractions and even to the border crossing into Mexico. The San Diego Trolley system will never be confused with a true subway system, but it does have one true underground station. Located under the campus of San Diego State University, this underground platform opened in 2005 when the Green Line opened. A tunnel was dug under the campus, where a subterranean station was built, allowing easy arrival and departure for students using the public rail system. So impressive is the SDSU station, with its attractive design, that in 2007 it was awarded a Grand Orchid award for local architectural achievement. After admiring the station itself, take a stroll around the massive campus, San Diego's oldest and largest university. If only to step off the train and onto this platform in the sky—that's the reason you'd want to check out the Grantville Station. From Interstate 8 you see it sweeping along the elevated tracks. But standing up on the platform, you realize how high up you are. Other than that, you'll probably want to step back on the next train, unless you work or do business in this heavily commercial area. If you're going to an event at SDCCU, this is the way to go. The station is just steps away from the stadium gates, and the station's platform mimics the stadium's architecture. You'll feel smugly satisfied as you roll away after the game as you watch the traffic jam of vehicles trying to exit the parking lot. As you head west from Stadium Station, you hit a stretch of stations that are heaven sent for those who love shopping. The Fenton Parkway station is next to Ikea and Costco; Rio Vista station has Sears and the Marriott nearby; Mission Valley Center station is at the tangled retail intersection of Mission Center and Hazard Center station has more retail available. But the Fashion Valley Transit Center delivers you right to San Diego's best shopping and entertainment mall. Shopping, restaurants, movies, hotels, even golf, are all within steps of the station. Plus, Fashion Valley is a transit hub for the major bus routes 6, 14, 20, 25, 41, 120, 928. The Old Town Transit Center is a major convergence point for San Diego's commuter rail systems. This is where you transfer from the Blue (north-south) line to the Green (east-west). In addition, Old Town is where you also can transfer to and from the Coaster commuter train that runs up San Diego's north coast. Pay attention when you transfer at Old Town to make sure you are boarding the proper trains to your destination. This is a great spot to spend some time and stroll through ​Old Town State Park and check out some early San Diego history, grab a meal, and do some shopping. America Plaza station is a transfer point if you're on the Blue line and want to switch to the Orange line's bay-front route. Check out the nifty European style metal, curving awning over the platform. This is a good spot to take a side trip and walk along the west side of downtown. The Museum of Contemporary Art is across the tracks, as is the historic Santa Fe Train Depot. A few blocks west of the station you'll find San Diego's picturesque Embarcadero. As you travel along this bayside spur of the Orange line, you'll come across three stations in prime waterfront locations. The Seaport Village station takes you to the popular tourist destination, and the ​Gaslamp Quarter station stops at the Fifth Avenue entrance to the bustling nightlife district. In between these two stations is the Convention Center station, which deposits you right at the massive waterfront Convention Center. If you're in town for a convention, this is your stop. But really, any of these stations will take you within walking distance of any of downtown's prime attractions. Back along the main leg of the Orange line, the Civic Center station is along the C Street corridor and is your prime stop if you have city hall or court business along the downtown core. In the area is the San Diego Civic Theater, the region’s largest performing arts venue. The Civic Theatre’s primary producers and presenters include the San Diego Opera, Broadway/San Diego, La Jolla Music Society, and the California Ballet. At the far east end of the Orange line's C Street corridor, the City College Station is the major stop for students heading to City College and San Diego High School. It's also a transfer point for buses heading up Park Blvd. to Balboa Park and the San Diego Zoo. It's a very close walk to City College itself and within walking of the east downtown eateries but reports of panhandlers make this a less interesting stop for visitors. The 12th Avenue Transit Center is another major transfer point for the Blue and Orange lines. It is also the location of the Metropolitan Transit System (MTS) headquarters, which operates the trolley and San Diego metro buses. With its clock tower as a landmark, it is also a major stop for passengers heading into and out of Petco Park, the San Diego Padres' downtown ballpark in the burgeoning East Village district. From this station, you can head south to the border or east to Santee. Heading east out of downtown along the Orange line, you'll be traveling through the southeast San Diego communities such as Sherman Heights, Logan Heights and Lincoln Acres. As you head farther east, through the Encanto neighborhood, you head out of San Diego and into the eastern suburbs. Your first stop is Lemon Grove, and at the Lemon Grove Depot, you are deposited in the middle of downtown Lemon Grove. Just across Broadway from the station, you'll see the giant plaster lemon landmark claiming "Best Climate on Earth." Strolling along main drag Broadway, you'll find lots of mom and pop businesses, antique shops, a Starbucks, and other services. If you're hungry, make sure you hit El Pollo Grill, which serves up some of the best flame-broiled chicken and Mexican food anywhere. A short walk away is also Berry's Athletic Supply, a Lemon Grove institution. As you head out of Lemon Grove, you continue on east to La Mesa. The La Mesa Blvd station is the one you'll want to hop off and you'll be rewarded with a full day of exploring La Mesa's village downtown business district. Downtown La Mesa is a favorite place to feel transported back into a calmer time. Stroll along La Mesa Blvd., where there are lots of antique shops, mom and pop businesses, and some good place to eat. A favorite is Mario's de La Mesa, a great Mexican restaurant in a converted house. Johnny B's Pub is where you'll want to go for great burgers. Check out Moze Guitars, where you can browse or get your stringed instrument fixed. Grossmont Transit Center is your main transfer point if you are switching from the Green line to the Orange line into downtown. From here, the Green line continues to the end in Santee, and the Orange line terminates at Gillespie Field in El Cajon. The station is at a bottom of the hill below Grossmont Shopping Center and Grossmont Hospital so you must climb a steep set of stairs or take the ​elevator. The El Cajon Transit Center at Main and Marshall is your major transfer point for all East County bus routes. It's also here where you can hop onto the Green line if you need to get to Santee. But it's at the next stop, the Arnele Station, that you'll probably want to take if you want to do shopping or business since this station is a couple of blocks from the Westfield Parkway Plaza Regional Mall, as well as all of the other surrounding retail and restaurants. The eastern terminus of the Green line is in Santee at the Santee Trolley Town Center Station. This is convenient because the trolley station is surrounded by a large big-box shopping center, Santee Trolley Square, with lots of retail and restaurants, including Barnes and Noble, Old Navy, Target, and more. From the 12th Ave. Transit center on the ​south, the trolley stations are for the most part just serviceable stops for daily commuters heading to or from the International Border. Heading from Barrio Logan past the 32nd Street Naval Station and through National City, the trolley takes you through industrial and commercial zoned areas. End of the line for the Blue line - the International Border Crossing at San Ysidro. And as you can imagine, it is one of the busiest of all trolley stations. Hop off here and it is just a quick walk across the border and into Tijuana. In fact, it's probably the easiest way to head down to Baja for a day trip if you don't plan and carrying back too many souvenirs. Here is also where many of the day workers from Mexico board public transit to get to their jobs in San Diego. About a half mile away is the huge Las Americas Outlet Center, which has some of the best selection of designer outlet stores in the county.